Since China entered the World Trade Organization in 2001, the extraordinary growth of trade between China and the United States has had a dramatic effect on U.S. workers and the domestic economy, though in neither case has this effect been beneficial. The United States is piling up foreign debt and losing export capacity, and the growing trade deficit with China has been a prime contributor to the crisis in U.S. manufacturing employment. 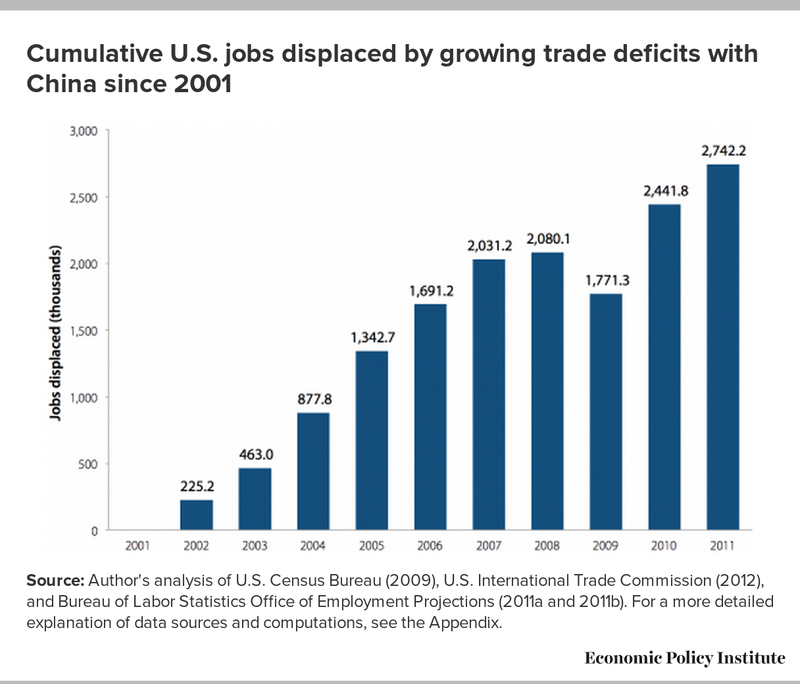 Between 2001 and 2011, the trade deficit with China eliminated or displaced more than 2.7 million U.S. jobs, over 2.1 million of which (76.9 percent) were in manufacturing. These lost manufacturing jobs account for more than half of all U.S. manufacturing jobs lost or displaced between 2001 and 2011. The more than 2.7 million jobs lost or displaced in all sectors include 662,100 jobs from 2008 to 2011 alone—even though imports from China and the rest of the world plunged in 2009. 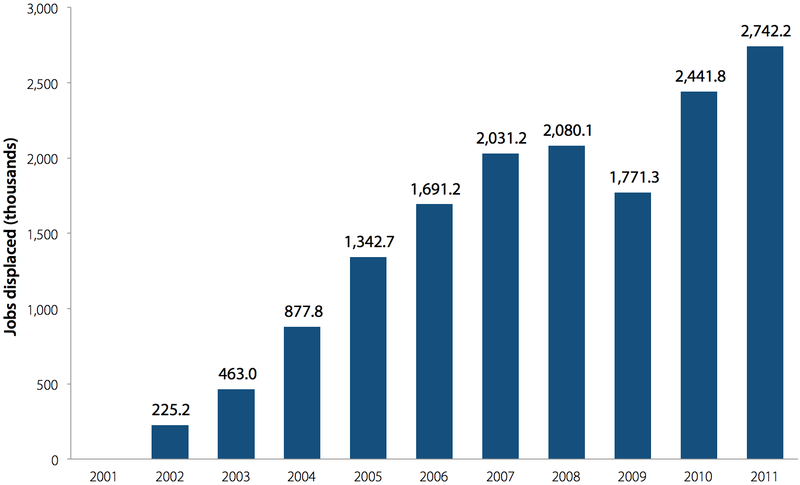 (Imports from China have since recovered and surpassed their peak of 2008.) The growing trade deficit with China has cost jobs in all 50 states and the District of Columbia and Puerto Rico, as well as in each congressional district. Among specific industries, the trade deficit in the computer and electronic products industry grew the most, and 1,064,800 jobs were displaced, 38.8 percent of the 2001–2011 total. As a result, many of the hardest-hit congressional districts were in California, Texas, Oregon, Massachusetts, Colorado, and Minnesota, where jobs in that industry are concentrated. Some districts in North Carolina, Georgia, and Alabama were also especially hard-hit by job displacement in a variety of manufacturing industries, including computers and electronic products, textiles and apparel, and furniture. But the jobs impact of the China trade deficit is not restricted to job loss and displacement. Competition with low-wage workers from less-developed countries such as China has driven down wages for workers in U.S. manufacturing and reduced the wages and bargaining power of similar, non-college-educated workers throughout the economy. The affected population includes essentially all workers with less than a four-year college degree—roughly 70 percent of the workforce, or about 100 million workers (U.S. Census Bureau 2012b). Put another way, for a typical full-time median-wage earner, earnings losses due to globalization totaled approximately $1,400 per year as of 2006 (Bivens 2008a). For a typical household with two earners, the annual cost is more than $2,500. China is the most important source of downward wage pressure from trade with less-developed countries because it pays very low wages and because its products make up such a large portion of U.S. imports (China was responsible for 55.3 percent of U.S. non-oil imports from less-developed countries in 2011). Most of the jobs lost or displaced by trade with China between 2001 and 2011 were in manufacturing industries (more than 2.1 million jobs, or 76.9 percent). Within manufacturing, rapidly growing imports of computer and electronic products (including computers, parts, semiconductors, and audio-video equipment) accounted for 54.9 percent of the $217.5 billion increase in the U.S. trade deficit with China between 2001 and 2011. The growth of this deficit contributed to the elimination of 1,064,800 U.S. jobs in computer and electronic products in this period. Indeed, in 2011, the total U.S. trade deficit with China was $301.6 billion—$139.3 billion of which was in computer and electronic products. Global trade in advanced technology products—often discussed as a source of comparative advantage for the United States—is instead dominated by China. This broad category of high-end technology products includes the more advanced elements of the computer and electronic products industry as well as other sectors such as biotechnology, life sciences, aerospace, and nuclear technology. In 2011, the United States had a $109.4 billion deficit in advanced technology products with China, which was responsible for 36.3 percent of the total U.S.-China trade deficit. In contrast, the United States had a $9.7 billion surplus in advanced technology products with the rest of the world in 2011. Other industrial sectors hit hard by growing trade deficits with China between 2001 and 2011 include apparel and accessories (211,200 jobs), textile mills and textile product mills (106,200), fabricated metal products (120,600), furniture and fixtures (80,700), plastics and rubber products (57,600), motor vehicles and parts (19,800), and miscellaneous manufactured goods (111,800). Several service sectors were also hit hard by indirect job losses, including administrative, support, and waste management services (160,600) and professional, scientific, and technical services (145,000). 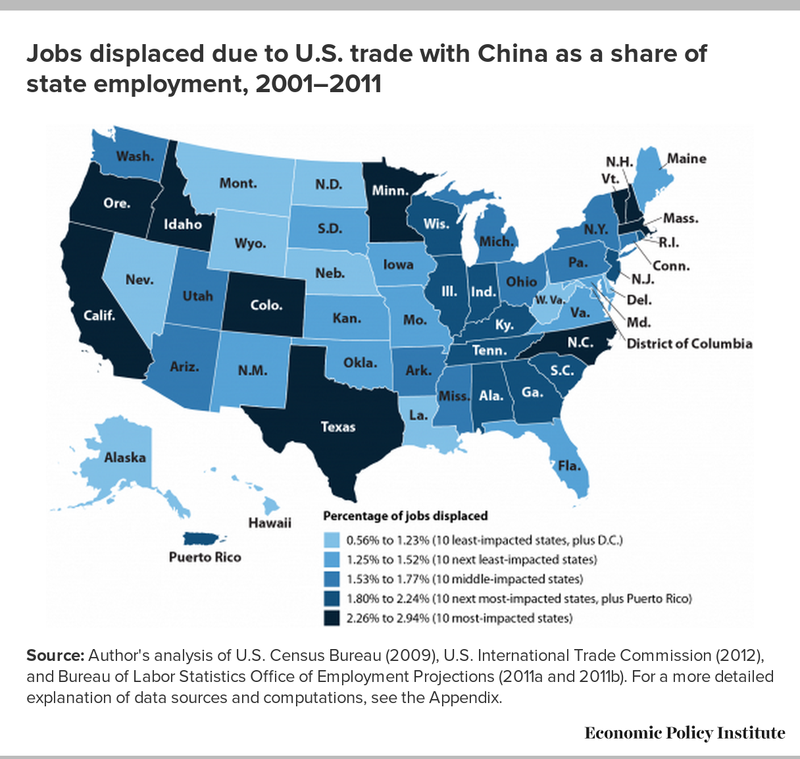 The more than 2.7 million U.S. jobs lost or displaced by the trade deficit with China between 2001 and 2011 were distributed among all 50 states, the District of Columbia, and Puerto Rico, with the biggest net losses occurring in California (474,700 jobs), Texas (239,600), New York (158,800), Illinois (113,700), North Carolina (110,300), Florida (106,100), Pennsylvania (101,200), Ohio (95,900), Massachusetts (92,700), and Georgia (87,300). 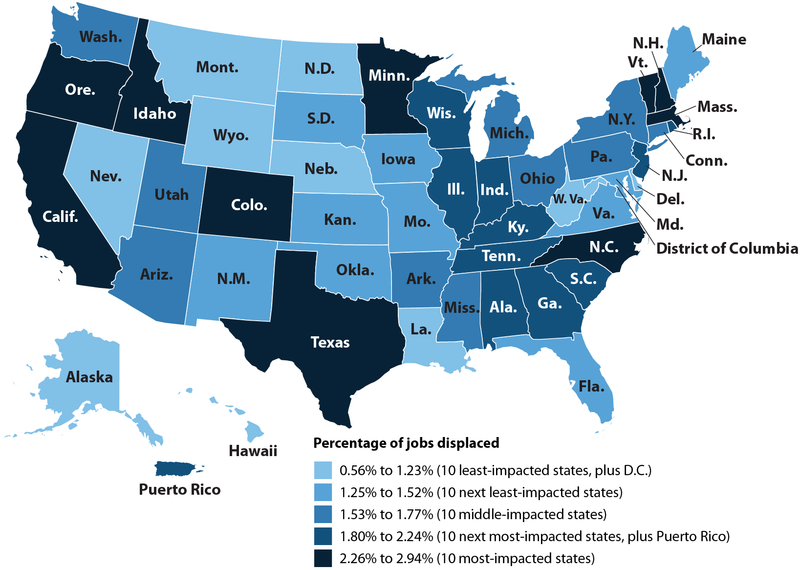 Jobs displaced due to growing deficits with China equaled or exceeded 2.2 percent of total employment in the 12 hardest-hit states: New Hampshire (20,400 jobs lost or displaced, equal to 2.94 percent of total state employment), California (474,700, 2.87 percent), Massachusetts (92,700, 2.86 percent), Oregon (50,200, 2.85 percent), North Carolina (110,300, 2.67 percent), Minnesota (72,300, 2.66 percent), Idaho (18,200, 2.65 percent), Vermont (8,000, 2.43 percent), Colorado (57,800, 2.38 percent), Texas (239,600, 2.26 percent), Rhode Island (11,800, 2.24 percent), and Alabama (43,900, 2.20 percent). The hardest-hit congressional districts were concentrated in states that were heavily exposed to growing China trade deficits in computer and electronic products and other industries such as furniture, textiles, apparel, and durable goods manufacturing. The three hardest-hit congressional districts were all located in Silicon Valley in California, including the 15th (Santa Clara County, which lost 44,700 jobs, equal to 13.77 percent of all jobs in the district), the 14th (Palo Alto and nearby cities, 32,700 jobs, 10.20 percent), and the 16th (San Jose and other parts of Santa Clara County, 29,000 jobs, 9.55 percent). Of the top 20 hardest-hit districts, seven were in California (in rank order, the 15th, 14th, 16th, 13th, 31st, 34th, and 50th), four were in Texas (31st, 10th, 25th, and 3rd), two were in North Carolina (4th and 10th), two were in Massachusetts (5th and 3rd), and one each in Oregon (1st), Georgia (9th), Colorado (4th), Minnesota (1st), and Alabama (5th). Each of these districts lost at least 11,400 jobs, or more than 3.7 percent of its total jobs. The job displacement estimates in this study are conservative. They include only the direct and indirect jobs displaced by trade, and exclude jobs in domestic wholesale and retail trade or advertising; they also exclude re-spending employment.1 However, during the Great Recession of 2007–2009, and continuing through 2011, jobs displaced by China trade reduced wages and spending, which led to further job losses. Today’s international trading system grew out of the Bretton Woods Agreements negotiated among Allied nations in July 1944. Bretton Woods established rules for financial relations among signatories and established the International Monetary Fund and the World Bank. A subsequent U.N. Conference on Trade and Employment produced the General Agreement on Tariffs and Trade (GATT) in 1947. The GATT treaty established the international trading system, which evolved as a series of global trade negotiations that refined the rules of the system while progressively lowering tariffs and non-tariff barriers. The Uruguay Round, which lasted from September 1986 until December 1993, led to the 1994 creation of the World Trade Organization, an institution charged with settling disagreements among nations regarding the rules agreed upon in GATT. The World Trade Organization was empowered to engage in dispute resolution and to authorize imposition of offsetting duties if its decisions were ignored or rejected by member governments. It expanded the trading system’s coverage to include a huge array of subjects never before included in trade agreements, such as food safety standards, environmental laws, social service policies, intellectual property standards, government procurement rules, and more (Wallach and Woodall 2011). Over time, countries that were not part of the original GATT group have sought entry into the WTO to gain improved market access for their goods at lower tariff levels, and to encourage development of their traded goods industries. Proponents of China’s entry into the WTO frequently claimed that it would create jobs in the United States, increase U.S. exports, and improve the trade deficit with China. In 2000, President Clinton claimed that the agreement then being negotiated to allow China into the WTO “creates a win-win result for both countries.” Exports to China “now support hundreds of thousands of American jobs,” and these figures “can grow substantially with the new access to the Chinese market the WTO agreement creates,” he said (Clinton 2000, 9–10). China’s entry into the WTO in 2001 was supposed to bring it into compliance with an enforceable, rules-based regime that would require China to open its markets to imports from the United States and other nations by reducing tariffs and addressing non-tariff barriers to trade. Promoters of liberalized U.S.-China trade argued that the United States would benefit because of increased exports to a large and growing consumer market in China. The United States also negotiated a series of special safeguard measures designed to limit the disruptive effects of surging imports from China on domestic producers. However, as a result of China’s currency manipulation and other trade-distorting practices, including extensive subsidies, legal and illegal barriers to imports, dumping, and suppression of wages and labor rights, the envisioned flow of U.S. exports to China did not occur. Further, the agreement spurred foreign direct investment in Chinese enterprises, which has expanded China’s manufacturing sector at the expense of the United States. Finally, the core of the agreement failed to include any protections to maintain or improve labor or environmental standards or to prohibit currency manipulation. In retrospect, the promises about jobs and exports misrepresented the real effects of trade on the U.S. economy: Trade leads to both job creation and job loss or displacement. (This paper describes the net effect of trade on employment as jobs “lost or displaced,” with the terms “lost” and “displaced” used interchangeably.) Increases in U.S. exports tend to create jobs in the United States, but increases in imports will lead to job loss—by destroying existing jobs and preventing new job creation—as imports displace goods that otherwise would have been made in the United States by domestic workers. This is what has occurred with China since it entered the WTO; the United States’ widening trade deficit with China is costing U.S. jobs. A major cause of the rapidly growing U.S. trade deficit with China is currency manipulation. Unlike other currencies, the Chinese yuan does not fluctuate freely against the dollar.2 Instead, China has tightly pegged its currency to the U.S. dollar at a rate that encourages a large bilateral trade surplus with the United States. As China’s productivity has soared, its currency should have adjusted, increasing in value to maintain balanced trade. But the yuan has instead remained artificially low as China has aggressively acquired dollars and other foreign exchange reserves to further depress the value of its own currency. (To depress the value of its own currency, a government can sell its own currency and buy government securities such as U.S. Treasury bills, which increases its foreign reserves.) China had to purchase $337 billion in U.S. Treasury bills and other securities between December 2010 and December 2011 alone to maintain the peg to the U.S. dollar (International Monetary Fund 2012a). As of June 30, 2012, China held a total of $3.24 trillion in foreign exchange reserves (Bloomberg News 2012), about 70 percent of which were held in U.S. dollars. This intervention makes the yuan artificially cheap relative to the dollar, effectively subsidizing Chinese exports. Although the yuan has appreciated significantly since 2005, economist H.W. Brock (2012) estimates that the Chinese currency is still massively undervalued, and is “arguably one-sixth of what it should be” (Miller 2012).3 New research by Joe Gagnon (2012, 3) estimates that massive currency manipulation, especially by countries in Asia, has raised “the current account of the developing economies by roughly $700 billion [per year], relative to what it would have been.” Gagnon also notes that this “amount is roughly equivalent to the large output gaps in the United States and euro area. In other words, millions more Americans and Europeans would be employed if other countries did not manipulate their currencies…” (Gagnon 2012, 1). China is the single most important currency manipulator, based on both its massive currency intervention over the past decade and its share of global current account surpluses.4 Currency intervention artificially raises the cost of U.S. exports to China and the rest of the world by a similar amount, making U.S. goods less competitive in that country and in every country where U.S. exports compete with Chinese goods. This is because China is the most important competitor for the United States in all other third country markets, even more important than Germany and all other members of the European Union combined. China’s currency manipulation has compelled other countries to follow similar policies in order to protect their relative competitiveness and to promote their own exports. Widespread currency manipulation has also contributed to the growth of very large global current account imbalances (a country’s current account balance is the broadest measure of its trade balance; there are currently many countries with large surpluses or deficits). Gagnon recommends that the rules of the WTO be changed to allow countries to impose tariffs on imports from currency manipulators. Since changing the rules of the WTO requires unanimous consent of all members, Gagnon observes that “the main targets of currency manipulation—the United States and euro area—may have to play tough. One strategy would be to tax or otherwise restrict purchases of U.S. and euro area financial assets by currency manipulators” (Gagnon 2012, 1). Such financial taxes would be “consistent with international law” (Gagnon 2011). A recent report showed that full revaluation of the yuan and other undervalued Asian currencies would improve the U.S. current account balance by up to $190.5 billion, thereby increasing U.S. GDP by as much as $285.7 billion, adding up to 2.25 million U.S. jobs, and reducing the federal budget deficit by up to $857 billion over 10 years (Scott 2011a). Revaluation would also help workers in China and other Asian countries by reducing inflationary overheating and increasing workers’ purchasing power. It would also benefit other countries. The undervaluation of the yuan has put the burden of global current account realignment pressures on other countries such as Australia, New Zealand, South Africa, and Brazil, along with members of the euro area, whose currencies have also become overvalued with respect to those of China and other currency manipulators. A growing number of economists, workers, members of Congress, businesses, and communities are calling for increased action on currency manipulation. The Ryan-Murphy Currency Reform for Fair Trade Act (H.R. 2378) was approved by the House of Representatives on September 29, 2010 (OpenCongress.org 2012), near the end of the 111th Congress.5 It received an 80 percent approval margin, with a vote of 348–79, with six abstentions. In the 112th Congress, the Senate passed a similar bill, the Currency Exchange Rate Oversight Reform Act of 2011 (S. 1619), authored by Sen. Sherrod Brown (D-Ohio), by a margin of 63–25 (Thomas 2012). A similar measure was introduced in the House in 2011 by Rep. Sander Levin with 234 cosponsors, but it is being held up by the House leadership. These bills would revise the Tariff Act of 1930 to include a “countervailable subsidy” that would allow tariffs to be imposed on some imports from countries with a “fundamentally undervalued currency.” There is strong bipartisan support for such legislation in Congress. Recently, a number of economists have condemned currency manipulation and developed innovative policy proposals for combating it. Paul Krugman has denounced China for its “predatory” trade policies (Krugman 2010). Fred Bergsten has described China’s currency intervention as the “largest protection measure adopted by any country since the Second World War—and probably in all of history” (Palmer 2011). Joseph Gagnon and Gary Hufbauer (2011) have developed a proposal for taxing Chinese assets in the United States. They recommend withholding a share of the proceeds of interest payments on U.S. Treasury securities held by China’s central bank. There are two problems with this proposal. First, since interest rates on U.S. securities are very low at present, a tax would have little impact on China. But the fundamental problem is that China is not holding and purchasing U.S. assets (at a rate of about $1 billion per day) to earn interest on these investments; these purchases are made simply to suppress the value of the Chinese yuan. Gagnon (2011) estimates that many developing countries are manipulating their currencies. IMF data show that foreign central banks are spending about $1.2 trillion per year buying foreign exchange reserves, with China making about half the purchases (according to the author’s analysis of IMF 2012a). These figures exclude sovereign wealth funds (SWFs), which many countries use to make investments in other countries; although Gagnon acknowledges that “foreign investment by SWFs clearly is currency manipulation,” he excludes it from his calculations “for now” (Gagnon 2012, 4). Gagnon (2011) estimates that U.S. net exports are $400 billion lower than they would be without currency manipulation, a figure that would support three million or more jobs per year. Currency manipulation is one practice that violates the rules of the international trading system set out in the GATT and WTO agreements (Stewart and Drake 2010). Other Chinese government policies also illegally encourage exports. China extensively suppresses labor rights, which lowers production costs within China. An AFL-CIO study estimated that repression of labor rights by the Chinese government has lowered manufacturing wages of Chinese workers by 47 percent to 86 percent (AFL-CIO, Cardin, and Smith 2006, 138). China also provides massive direct export subsidies to many key industries (see, for example, Haley 2008, 2009, 2012). Finally, it maintains strict, non-tariff barriers to imports. As a result, China’s $398.5 billion of exports to the United States in 2011 were more than four times greater than U.S. exports to China, which totaled only $96.9 billion (Table 1), making the China trade relationship the United States’ most imbalanced by far. * Domestic exports are goods produced in the United States and exclude re-exports, i.e., goods produced in other countries and shipped through the United States. Total exports as reported by the U.S. International Trade Commission include re-exports. Total exports were estimated to be $103.9 billion in 2011, and U.S. re-exports to China represent 6.72% of total exports. The employment estimates shown here are based on domestic exports only. See endnotes nine and 10 for additional details. Source: Author's analysis of U.S. Census Bureau (2009), U.S. International Trade Commission (2012), and Bureau of Labor Statistics Office of Employment Projections (2011a and 2011b). For a more detailed explanation of data sources and computations, see the Appendix. Copy the code below to embed this chart on your website. Partly because the agreement accepting China into the WTO failed to include any protections to maintain or improve labor or environmental standards, China’s entry has further tilted the international economic playing field against U.S. domestic workers and firms and in favor of multinational companies from the United States and other countries, as well as state- and privately owned exporters in China. This shift has accelerated the global “race to the bottom” in wages and environmental quality and closed thousands of U.S. factories, decimating employment in a wide range of communities, states, and entire regions of the United States. U.S. national interests have suffered while U.S. multinationals have enjoyed record profits on their foreign direct investments (Scott 2007, 2011b). Some actions have recently been taken in response. In September 2009, the Obama administration announced that it would take action to restrict imports of Chinese tires for three years under the special safeguard measures, the first time since 2001 that these measures had been utilized. In September 2010, the United Steelworkers (USW) filed a Section 301 petition with the U.S. Trade Representative, accusing China of illegally stimulating and protecting producers of green technology exports, ranging from wind and solar energy products to advanced batteries and energy-efficient vehicles. Indeed, the U.S. trade deficit in clean energy products had more than doubled between 2008 and 2010, displacing more than 8,000 U.S. jobs in 2010 alone (Scott 2010). The 2010 USW petition details more than 80 Chinese laws, regulations, and practices that violate international trade agreements and have hurt U.S. clean energy manufacturing and green technology industries. In July 2012, the Obama administration filed a WTO complaint against China over its tariffs on large vehicles exported from the United States to China. This was the seventh complaint filed by the administration against China, and the previous six have all been successful (Scott 2012). Proponents of trade deals such as the agreement to endorse China’s admission to the World Trade Organization usually focus on the impacts of these deals on tariff and non-tariff barriers to trade.7 China agreed to make major tariff reductions as a condition of entry into the WTO. President Clinton and many others argued that since U.S. tariff barriers were already low, the agreement would have a much larger effect on U.S. exports to China than on U.S. imports. But proponents failed to consider the effect of China’s entry on foreign direct investment (FDI) and outsourcing. FDI has played a key role in the growth of China’s manufacturing sector. China is the largest recipient of FDI of all developing countries (Xing 2010) and is the third-largest recipient of FDI over the past three decades, trailing only the United States and the United Kingdom. Foreign-invested enterprises (both joint ventures and wholly owned subsidiaries) were responsible for 52.4 percent of China’s exports and 84.1 percent of its trade surplus in 2011 (Ministry of Commerce, China 2012). Outsourcing—through foreign direct investment in factories that make goods for export to the United States—has played a key role in the shift of manufacturing production and jobs from the United States to China since it entered the WTO in 2001. Foreign invested enterprises were responsible for the vast majority of China’s global trade surplus in 2011. Another critically important promise made by the promoters of liberalized U.S.-China trade was that the United States would benefit because of increased exports to a large and growing consumer market in China. However, despite widespread reports of the rapid growth of the Chinese middle class, this growth has not resulted in a significant increase in U.S. consumer exports to China. The most rapidly growing exports to China are bulk commodities such as grains, scrap, and chemicals; intermediate products such as semiconductors; and producer durables such as aircraft and non-electrical machinery (see the discussion of Table 2 later in this paper, and Supplemental Table C to this report at http://www.epi.org/publication/bp345-china-growing-trade-deficit-cost/). Furthermore, the increase in U.S. exports to China since 2001 has been overwhelmed by the growth of U.S. imports, as discussed next. The bottom line of the influences discussed above is this: As a result of China’s currency manipulation and other trade-distorting practices (including extensive subsidies, legal and illegal barriers to imports, dumping, and suppression of wages and labor rights), the increase in foreign direct investment in China and related growth of its manufacturing sector, and the absence of a growing market for U.S. consumer goods in China, the U.S. trade deficit with China rose from $84.1 billion in 2001 to $301.6 billion in 2011, an increase of $217.5 billion, as shown in Table 1. Since China entered the WTO in 2001, this deficit has increased annually by $21.7 billion, or 13.6 percent, on average. Despite the collapse in world trade between 2008 and 2009 caused by the Great Recession, the U.S. trade deficit with China increased $31.2 billion between 2008 and 2011. China’s share of the overall U.S. trade deficit increased from 32.6 percent to 40.8 percent, and its share of the total U.S. non-oil trade deficit jumped from 69.6 percent in 2008 to 77.7 percent in 2011 (according to the author’s analysis of U.S. International Trade Commission 2012). Each $1 billion in exports to China from the United States supports some American jobs. However, each $1 billion in imports from China displaces the American workers who would have been employed making these products in the United States. The net employment effect of trade depends on the changes in the trade balance. An improving trade balance can support job creation, but growing trade deficits usually result in growing net U.S. job displacement. The United States has had large trade deficits with China since 2001, which increased in every year except 2009, when U.S. trade with all countries collapsed due to the recession of 2007–2009. The Economic Policy Institute and other researchers have examined the job impacts of trade in recent years by netting the job opportunities lost to imports against those gained through exports. This report uses standard input-output models and data to estimate the jobs displaced by trade. Many reports by economists in the public and private sectors have used an “all-but-identical” methodology to estimate jobs gained or displaced by trade, including Groshen, Hobijn, and McConnell (2005) of the Federal Reserve Bank of New York, and Bailey and Lawrence (2004) in the Brookings Papers on Economic Activity. The U.S. Department of Commerce recently published estimates of the jobs supported by U.S. exports (Tschetter 2010). That study used input-output and “employment requirements” tables from the Bureau of Labor Statistics Office of Employment Projections (2011a), the same source used to develop job displacement estimates in this report. The Tschetter report represents the work of a panel of experts from 20 federal agencies, including Mark Doms, chief economist at the U.S. Department of Commerce, and David Walters, chief economist at the Office of the U.S. Trade Representative. The employment impacts of the growing U.S. trade deficit with China are estimated in this paper using an input-output model that estimates the direct and indirect labor requirements of producing output in a given domestic industry. The model includes 195 U.S. industries, 77 of which are in the manufacturing sector (see the box titled “Trade and employment models,” as well as the Appendix, for details on model structure and data sources). The Bureau of Labor Statistics Office of Employment Projections (BLS–OEP) revised and updated its labor requirements model and related data in December 2011 (a; b). Our models have been completely revised and updated using the newest, best available data for this report. The model estimates the amount of labor (number of jobs) required to produce a given volume of exports and the labor displaced when a given volume of imports is substituted for domestic output.9 The difference between these two numbers is essentially the jobs displaced by growing trade deficits, holding all else equal. Jobs displaced by the growing China trade deficit are a net drain on employment in trade-related industries, especially those in manufacturing. Even if increases in demand in other sectors absorb all the workers displaced by trade (which is unlikely), job quality will likely suffer because many non-traded industries such as retail and home health care pay lower wages and have less comprehensive benefits than traded-goods industries. U.S. exports to China in 2001 supported 169,400 jobs, but U.S. imports displaced production that would have supported 1,139,500 jobs, as shown in the bottom half of Table 1. Therefore, the $84.1 billion trade deficit in 2001 displaced 970,100 jobs in that year. Job displacement rose to 3,050,200 jobs in 2008 and 3,712,300 jobs in 2011. Since China’s entry into the WTO in 2001 and through 2011, the increase in U.S.-China trade deficits eliminated or displaced 2,742,200 U.S. jobs, as shown in the bottom half of Table 1. Rising trade deficits have displaced a growing number of jobs every year since China joined the WTO, with the exception of 2009 (during the Great Recession), as shown in Figure A. The U.S. trade deficit with China increased by $31.2 billion (or 11.6 percent) between 2008 and 2011, and the number of jobs displaced increased by 21.7 percent. Meanwhile, the U.S. trade deficit with the rest of the world declined 19.3 percent between 2008 and 2011 (according to the author’s analysis of U.S. International Trade Commission 2012). These figures illustrate the damage done when China took advantage of the Great Recession to expand its beggar-thy-neighbor trade policies through currency manipulation and other illegal and unfair trade policies, which undermined job creation in the U.S. economy throughout the downturn. Between 2008 and 2011 alone 662,100 jobs were lost, either by the elimination of existing jobs or by the prevention of new job creation (Figure A). On average, 274,200 jobs per year have been lost or displaced since China’s entry into the WTO (Table 1). The continuing growth of job displacement between 2008 and 2011 despite the relatively small increase in the trade deficit reflects the relatively rapid growth of U.S. imports of computer and electronics products from China, and the fact that the price index for most of these products fell continuously throughout the study period, as noted later in this paper. The share of U.S. imports from China accounted for by computer and electronic products (in current, nominal dollars) increased from 32.9 percent in 2008 to 37.4 percent in 2011 (according to the author’s analysis of USITC 2012). * Excludes utilities, construction, and service sectors, which do not have trade in these data. ** Includes publishing industries (excluding Internet); goods trade in this sector is concentrated in NAICS 5111, Newspaper, periodical, book, and directory publishers. Source: Author's analysis of U.S. International Trade Commission (2012). For a more detailed explanation of the data sources and computations, see the Appendix. The composition of imports from China is changing in fundamental ways, with serious implications for certain kinds of high-skill, high-wage jobs once thought to be the hallmark of the U.S. economy. China is moving rapidly “upscale,” from low-tech, low-skilled, labor-intensive industries such as apparel, footwear, and basic electronics to more capital- and skills-intensive sectors such as computers, electrical machinery, and motor vehicle parts. It has also developed a rapidly growing trade surplus in high-technology products. From 2001 to 2011, imports from China increased dramatically, rising from $102.1 billion in 2001 to $398.5 billion in 2011, as shown in Table 1.10 Table 2 provides a snapshot of the changes in goods trade flows between 2001 and 2011, by sector, for exports, imports, and the trade balance. The rapid growth of the bilateral trade deficit in computer and electronic products (including computers, parts, semiconductors, and audio-video equipment) accounted for more than 54.9 percent of the $217.5 billion increase in the U.S. trade deficit with China between 2001 and 2011. 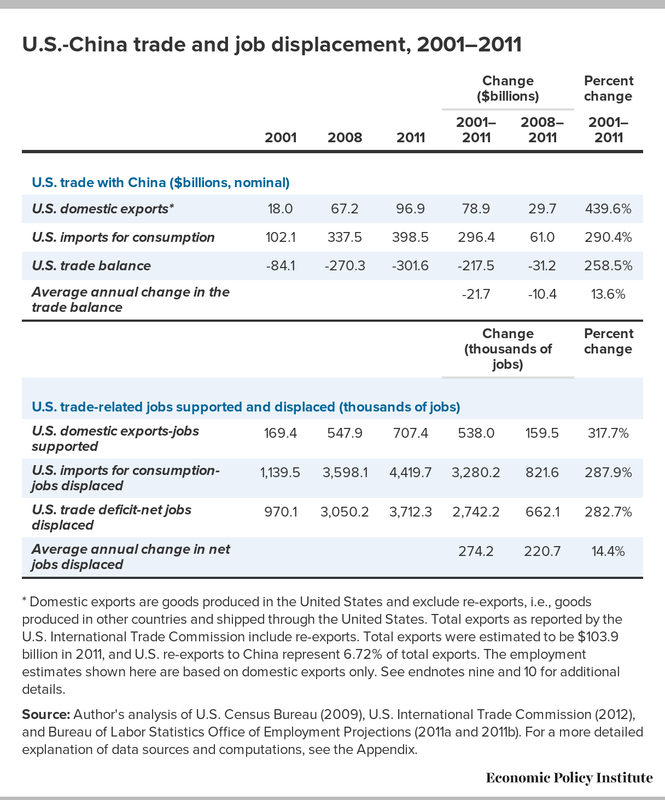 In 2011, the total U.S. trade deficit with China was $301.6 billion—$139.3 billion of which was in computer and electronic products (trade flows by industry in 2001 and 2011 are shown in Supplemental Table C, available at http://www.epi.org/publication/bp345-china-growing-trade-deficit-cost/). Table 2 shows that the growth in manufactured imports explained 99.2 percent of total growth in imports from China between 2001 and 2011, and included a wide array of products. Computer and electronic products were responsible for 42.1 percent of the growth in imports in this period, including computer equipment ($60.2 billion, or 20.3 percent of the overall growth in imports) and communications, audio, and video equipment ($46.4 billion, 15.6 percent). Other major importing sectors included apparel ($23.8 billion, 8.0 percent) and miscellaneous manufactured commodities ($22.7 billion, 7.7 percent). U.S. exports to China rose rapidly from 2001 to 2011, but from a much smaller base, from $18.0 billion in 2001 to $96.9 billion in 2011 (as depicted in Table 1). As Table 2 shows, manufacturing was the top industry exporting to China—63.5 percent of the growth in exports to China between 2001 and 2011 was in manufactured goods, totaling $50.2 billion. Within manufacturing, key export-growth sectors included chemicals ($11.1 billion, or 14.0 percent of the growth in exports), aerospace products and parts ($3.8 billion, 4.8 percent), machinery ($7.9 billion, 10.0 percent), and motor vehicles and parts ($6.0 billion, 7.6 percent). Scrap and second-hand goods industries (which support no jobs, according to BLS–OEP 2011a models11) accounted for 13.2 percent ($10.4 billion) of the growth in exports. Agricultural exports, which were dominated by corn, soybeans, and other cash grains, grew faster than any individual manufacturing sector, increasing $15.8 billion (20.0 percent of the total increase) between 2001 and 2011. Nonetheless, the overall scale of U.S. exports to China in 2011 was dwarfed by imports from China in that year, which exceeded the value of exports by more than 4 to 1. The data reflect China’s rapid expansion into higher-value-added commodities once considered strengths of the United States, such as computer and electronic products, which accounted for 37.4 percent ($149.2 billion) of U.S. imports from China in 2011. This growth is apparent in the shifting trade balance in advanced technology products (ATP), a broad category of high-end technology goods trade tracked by the U.S. Census Bureau.12 ATP includes the more advanced elements of the computer and electronic products industry as well as other sectors such as biotechnology, life sciences, aerospace, nuclear technology, and flexible manufacturing. The ATP sector includes some auto parts; China is now one of the top suppliers of auto parts to the United States, having recently surpassed Germany (Scott and Wething 2012). In 2011, the United States had a $109.4 billion trade deficit with China in ATP, reflecting a nine-fold increase from $11.8 billion in 2002. This ATP deficit was responsible for 36.3 percent of the total U.S.-China trade deficit in 2011. It dwarfs the $9.7 billion surplus in ATP that the United States had with the rest of the world in 2011, the result of a 5.1 percent annual increase in U.S. ATP exports to the rest of the world between 2002 and 2011. As a result of the U.S. ATP deficit with China, the United States ran an overall deficit in ATP products in 2011 (of $99.6 billion), as it has in every year since 2002 (U.S. Census Bureau 2012c). * Subcategory and category totals may not sum exactly due to rounding. Trade deficits are highly correlated with job loss or displacement by industry, as shown in Table 3. Growing trade deficits with China eliminated 2,109,700 manufacturing jobs between 2001 and 2011, more than three-quarters (76.9 percent) of the total. By far the largest job displacements occurred in the computer and electronic products sector, which lost 1,064,800 jobs (38.8 percent of the more than 2.7 million jobs displaced overall). This sector includes computer and peripheral equipment (620,700 jobs, 22.6 percent of the overall jobs displaced), semiconductors and components (235,000 jobs, 8.6 percent), and communications, audio, and video equipment (203,500 jobs, 7.4 percent). Other hard-hit sectors included apparel and accessories (211,200 jobs displaced, equal to 7.7 percent of the total), textile mills and textile product mills (106,200, 3.9 percent), fabricated metal products (120,600, 4.4 percent), furniture and fixtures (80,700, 2.9 percent), plastics and rubber products (57,600, 2.1 percent), motor vehicles and parts (19,800, 0.7 percent), and miscellaneous manufacturing (111,800 jobs, 4.1 percent). Several service industries, which provide key inputs to traded-goods production, experienced significant job displacement, including administrative, support, and waste management services (160,600 jobs, 5.9 percent) and professional, scientific, and technical services (145,000 jobs, 5.3 percent). Growing trade deficits with China have reduced demand for goods produced in every region of the United States and led to job displacement in all 50 states, Puerto Rico, and the District of Columbia, as shown in Table 4 and Figure B. (Appendix Table 1 ranks the states by the number of net jobs displaced, while Appendix Table 2 presents the same data but sorts the states alphabetically.) Table 4 shows that jobs displaced from 2001 to 2011 due to growing deficits with China equaled or exceeded 2.2 percent of total state employment in states such as New Hampshire, California, Massachusetts, Oregon, North Carolina, Minnesota, Idaho, Vermont, Colorado, Texas, Rhode Island, and Alabama. As shown in Appendix Tables 1 and 2, nearly 475,000 jobs were lost in California, compared with nearly 240,000 in Texas, almost 159,000 in New York, and nearly 114,000 in Illinois. The more than 2.7 million U.S. jobs displaced due to growing trade deficits with China represented about 1.9 percent of total U.S. employment (Table 4). * Average state employment in 2005–2007. Analysis based on pooled, three-year time series data from the U.S. Census American Community Survey, as described in the Appendix. ** Total may vary slightly due to rounding. Figure B shows the broad impact of growing trade deficits with China across the United States, with no areas exempt. Job losses have been most concentrated in states with high-tech industries, such as California, Massachusetts, Oregon, Minnesota, Idaho, Colorado, and Texas, and in manufacturing states, including New Hampshire, North Carolina, and Vermont. Other hard-hit states include traditional manufacturing powers such as Rhode Island, Alabama, South Carolina, Georgia, Tennessee, Wisconsin, Kentucky, Indiana, Illinois, New Jersey, New York, Ohio, and Pennsylvania. The top 20 hardest-hit congressional districts are shown in Table 5. Seven were in California, four were in Texas, two were in North Carolina, two were in Massachusetts, and one each was in Oregon, Georgia, Colorado, Minnesota, and Alabama. 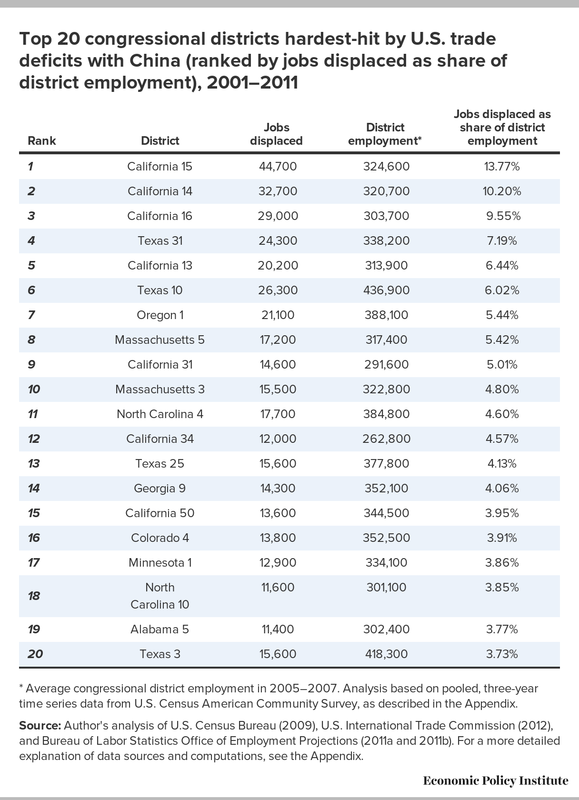 Each of these districts lost at least 11,400 jobs between 2001 and 2011, or more than 3.7 percent of its total jobs. These distributions reflect both the size of some states (e.g., California and Texas) and also the concentration of the industries hardest-hit by growing China trade deficits, such as computer and electronic products and other industries including furniture, textiles, apparel, and durable goods manufacturing. * Average congressional district employment in 2005–2007. Analysis based on pooled, three-year time series data from U.S. Census American Community Survey, as described in the Appendix. The three hardest-hit congressional districts were all located in Silicon Valley in California, including the 15th (Santa Clara County), the 14th (Palo Alto and nearby cities), and the 16th (San Jose and other parts of Santa Clara County). Growing trade deficits with China have clearly reduced domestic employment in traded-goods industries, especially in the manufacturing sector, which has been pummeled by plant closings and job losses. Workers from the manufacturing sector displaced by trade have had particular difficulty securing comparable employment elsewhere in the economy. Many have not been reemployed, and more than half of those reemployed have experienced a decline in wages. One-third experienced a wage decline of more than 20 percent, according to the most recent Bureau of Labor Statistics survey covering workers displaced from January 2007 to December 2009 (BLS 2010). Nearly two-thirds (61.3 percent) of displaced workers in manufacturing remained unemployed, including 16.7 percent who were not in the labor force. The average wage decline for those who were reemployed was 17.5 percent (Farber 2011, 21). The lost output of unemployed workers, especially that of labor force dropouts, can never be regained and is one of the largest costs of displacement to the economy as a whole. The employment impacts of trade identified in this paper can be interpreted as the “all else equal” effect of trade on domestic employment. The Federal Reserve, for example, may decide to cut interest rates to make up for job losses stemming from deteriorating trade balances (or any other economic influence), leaving net employment unchanged. This, however, does not change the fact that trade deficits by themselves are a net drain on employment. Many of the mechanisms that could offset employment losses caused by growing trade deficits are not operating in the current downturn. The Federal Reserve cannot cut interest rates any further than it already has, and interest-rate-sensitive industries such as residential construction are not experiencing employment gains from lower rates. In short, in today’s economy with its high unemployment rate, jobs displaced due to trade deficits with China are much more likely to be actual net, economy-wide losses than simply job reallocations. The growing U.S. trade deficit with China has displaced millions of jobs in the United States and contributed heavily to the crisis in U.S. manufacturing employment, which has heightened over the last decade largely due to trade with China. Moreover, the United States is piling up foreign debt, losing export capacity, and facing a more fragile macroeconomic environment. Is America’s loss China’s gain? The answer is not clearly affirmative. China has become dependent on the U.S. consumer market for employment generation, suppressed the purchasing power of its own middle class with a weak currency, and, most important, now holds over $3 trillion in hard currency reserves instead of investing them in public goods that could benefit Chinese households. Although economic growth in China has been rapid, it is unbalanced and unsustainable. Its vast purchases of foreign exchange reserves have led to the overheating of its domestic economy, and inflation in China has accelerated rapidly in the recent past. Its repression of labor rights has suppressed wages, thereby artificially subsidizing exports. China’s economy is teetering on the edge between inflation and a growth slump, and a soft landing is nowhere in sight. China needs to rebalance its economy by becoming less dependent on exports and more dependent on domestic demand led by higher wages and infrastructure spending. The U.S.-China trade relationship needs a fundamental change. Addressing the exchange rate policies and labor standards issues in the Chinese economy is an important first step. It is time for the administration to respond to the growing chorus of calls from economists, workers, businesses, and Congress and take action to stop illegal currency manipulation by China and other countries. —The author thanks Ross Eisenbrey for comments, Hilary Wething for research assistance, Michael McCarthy and Patrick Watson for editing, and Dan Essrow for graphic design assistance. —This research was made possible by support from the Alliance for American Manufacturing. The trade and employment analyses in this report are based on a detailed, industry-based study of the relationships between changes in trade flows and employment for each of approximately 195 individual industries of the U.S. economy, specially grouped into 53 custom sectors17 and using the North American Industry Classification System (NAICS) with data obtained from the U.S. Census Bureau (2009) and the U.S. International Trade Commission (USITC 2012). This study separates exports produced domestically from foreign exports—which are goods produced in other countries, exported to the United States, and then re-exported from the United States. Because only domestically produced exports generate jobs in the United States, employment calculations here are based only on domestic exports. The measure of the net impact of trade used here to calculate the employment content of trade is the difference between domestic exports and consumption imports. The number of jobs supported by $1 million of exports or imports for each of 195 different U.S. industries is estimated using a labor requirements model derived from an input-output table developed by the BLS–OEP (2011a).18 This model includes both the direct effects of changes in output (for example, the number of jobs supported by $1 million in auto assembly) and the indirect effects on industries that supply goods used in the manufacture of cars. The indirect impacts include jobs in auto parts, steel, and rubber, as well as service industries such as accounting, finance, and computer programming. This model estimates the labor content of trade using empirical estimates of labor content and trade flows between U.S. industries in a given base year (an input-output table for the year 2001 was used in this study) that were developed by the U.S. Department of Commerce and the BLS–OEP. It is not a statistical survey of actual jobs gained or lost in individual companies, or the opening or closing of particular production facilities (Bronfenbrenner and Luce 2004 is one of the few studies based on news reports of individual plant closings). Nominal trade data used in this analysis were converted to constant 2005 dollars using industry-specific deflators (see next section for further details). This was necessary because the labor requirements table was estimated using price levels in that year. Data on real trade flows were converted to constant 2005 dollars using industry-specific price deflators from the BLS–OEP (2011b). These price deflators were updated using Bureau of Labor Statistics producer price indexes (industry and commodity data; Bureau of Labor Statistics 2012b). Use of constant 2005 dollars was required for consistency with the other BLS models used in this study. Step 1. U.S.-China trade data were obtained from the U.S. International Trade Commission DataWeb (U.S. International Trade Commission 2012) in four-digit, three-digit, and two-digit NAICS format. Consumption imports and domestic exports are downloaded for each year. Step 2. To conform to the BLS Employment Requirements tables (BLS–OEP 2011a), trade data must be converted into the BLS industry classifications system. For NAICS-based data, there are 195 BLS industries. The data are then mapped from NAICS industries onto their respective BLS sectors. The trade data, which are in current dollars, are deflated into real 2005 dollars using published price deflators from the BLS–OEP (2011b) and the Bureau of Labor Statistics (2012b). Step 3. Real domestic employment requirements tables are downloaded from the BLS (2011a). These matrices are input-output industry-by-industry tables that show the employment requirements for $1 million in outputs in 2005 dollars. So, for industry i the aij entry is the employment indirectly supported in industry i by final sales in industry j and where i=j, the employment directly supported. [J2001] is a 195×2 matrix of job displacement by imports and jobs supported by exports for each of 195 industries in 2001. Similarly, [J2008] and [J2011] are 195×2 matrices of jobs displaced or supported by imports and exports (respectively) for each of 195 industries in 2008 and 2011, respectively. The employment estimates for retail trade, wholesale trade, and advertising were set to zero for this analysis. We assume that goods must be sold and advertised whether they are produced in the United States or imported for consumption. where [Stjnx01-11] is the 53×52 matrix of job displacement/support by state by industry. To get state total job displacement, we add up the subsectors in each state. Employment by congressional district, by industry, by state is obtained from the ACS data from 2005–2007. In order to calculate job displacement in each congressional district, we use each column in [Stjnx01-11], which represent individual state job-displacement-by-industry estimates, and define them as [Stj01], [Stj02], [Stji]…[Stj52], with i representing the state number and each matrix being 53×1. where [Cdji] is defined as the 53xY job displacement in state i by congressional district by industry. Congressional districts are estimated for the 110th Congress, which met from January 2007 through January 3, 2009 (including a lame duck session) (Beth and Soltis 2009). To get total job displacement by congressional district, we add up the subsectors in each congressional district in each state. 1. Direct jobs displaced refer to jobs displaced within a given industry, such as motor vehicles and parts. Indirect jobs displaced are those displaced in industries that supply inputs into that sector, such as primary metal (e.g., steel), plastics and rubber products (e.g., tires and hoses), transportation, and information. Re-spending employment results from the spending of wages by employed workers. It is one form of a macroeconomic multiplier. 2. The official name of the Chinese currency is the renminbi (RMB) and the units of value are yuan, the term used to describe the currency throughout this paper. 3. Over the past two decades, China first massively devalued its currency (in 1994) and then gradually increased its value, especially after 2005. While the yuan gained 31 percent in nominal terms between 2005 and 2011 (IMF 2012a), its nominal, 2011 value (at year end) remained 17 percent below the par value in 1990. As Gagnon notes, “In many developing countries, manipulation prevented the normal trend appreciation associated with rapid economic growth rather than causing any outright depreciation. The point is that without trend appreciation, such countries experience growing trade and currency account surpluses” (Gagnon 2012, 3, note 2). Such countries would normally experience trend appreciation due to rapid productivity growth, especially in manufacturing (the sector that generates most exports). Between 1995 and 2009 China experienced manufacturing productivity growth that ranged between 6.7 percent and 9.6 percent per year (FutureofUSChinaTrade.com 2012). Over the same period, productivity growth in U.S. manufacturing averaged only 2.4 percent per year (BLS 2012c). 4. China’s accumulation of total foreign exchange reserves (minus gold) between 2001 and 2011 accounted for more than one-third (36.6 percent) of total world accumulation of reserves, exceeding the next largest accumulator (Saudi Arabia) by 466 percent. As a result, China’s current account surplus was the largest, by far, of the 20 top currency manipulators identified by Gagnon (2012, 7, Table 1). In 2010 China’s current account surplus was a self-reported $305.3 billion, which was 31 percent of the current account surpluses of the top 20 currency manipulators (IMF 2012b). The IMF conservatively projects that China’s share of the global current account surplus of these 20 countries will rise to 53 percent in 2017, assuming continuation of current policies. 5. The Senate failed to consider a companion measure to H.R. 2378 in the 111th Congress. 6. Jeanne, Subramanian, and Williamson (2012) have recently published a book questioning the need for open capital accounts, especially for central bank purchases of government debt securities (such as U.S. Treasuries). They note that the economic literature has shown that such transfers make no contribution to economic growth. While they call for the use of price regulation (through taxes on foreign capital inflows), their arguments also support the case for outright restrictions on certain types of foreign capital movement, such as systematic foreign exchange intervention by central banks. 7. China’s admission to the WTO was endorsed by the United States in domestic legislation that offered China permanent normal trade relations status. 8. Beginning in 2002, the dollar declined more than 30 percent against several major currencies such as the euro and the Canadian dollar. However, yuan appreciation was largely delayed until late 2007 and 2008—too little to be of any help in slowing the current U.S.-China trade gap to date. The appreciation of the yuan has had little effect on the prices of U.S. imports from China, which rose only 2.5 percent between July 2005 (when the yuan was first adjusted) and May 2008, much less than the 19 percent appreciation of the yuan in that period (Congressional Budget Office 2008, 2). Furthermore, given the continuing rapid growth in manufacturing labor productivity in China relative to the United States and other developed countries, there must be trend appreciation in the yuan for China to simply maintain its global trade surplus, as noted by Gagnon (2012, 3, note 2). 9. The analysis in this report is based on domestic exports, as shown in Table 1, and excludes re-exports—which are goods produced in other countries, imported into the United States, and then re-exported to China. Since re-exports are not produced domestically, their production does not support domestic employment, and they are excluded from the model used here. 10. Tables 1 and 2 report U.S. imports for consumption and domestic exports to China. These flows were chosen to emphasize goods produced and consumed in the United States. News reports from the Census Bureau and the Commerce Department usually emphasize general imports and total exports. Total exports as reported by the Census Bureau include re-exports, i.e., goods produced in other countries and shipped through the United States. For 2011, general imports from China were $399.3 billion, total exports were $103.9 billion, and the reported trade balance was -$295.5 billion (U.S. International Trade Commission 2012). 11. Scrap and used or second-hand goods are industries 192 and 193, respectively, in the BLS model, and there are no jobs supported or displaced by trade in these sectors, according to the BLS model. 12. ATPs are an amalgamation of products from a variety of industries and subsectors within the broad NAICS-based categories shown in Table 2. They consist of 10 categories of products including biotechnology, life science, opto-electronics, information and communications, electronics, flexible manufacturing, advanced materials, aerospace, weapons, and nuclear technology (U.S. Census Bureau 2012a). In total ATP trade with the world, the United States had exports of $286.8 billion and imports of $386.4 billion in 2011, and a trade deficit of $99.6 billion. The United States had total ATP exports to China in 2011 of $20.1 billion and imports of $129.5 billion, and a trade deficit of $109.4 billion. This exceeded the overall U.S. ATP deficit of $99.6 billion. Thus, the United States had an ATP trade surplus with the rest of the world in 2011 of $9.7 billion (U.S. Census Bureau 2012c). 13. Deflators for many sectors in the computer and electronics products industry fell sharply between 2001 and 2011 due to rapid productivity growth in those sectors. For example, the price index for computer and peripheral products fell from 1,695.8 in 2001 to 620 in 2011, a decline of 63.4 percent (the price index is set at 1000 in 2005, the base year). In order to convert from nominal to real values for 2011, for example, the nominal value is multiplied by 1000/620 (the price index in year 2011) = 1.61. Thus, the real value of computers and peripheral products is at least 50 percent greater than the nominal value in 2011. The average price deflator in computer and electronic products declined 22.2 percent between 2001 and 2011, and real values exceeded nominal values by 33.0 percent on a trade-weighted basis. 14. California, Colorado, Idaho, Massachusetts, Minnesota, Oregon, and Texas, all hard-hit states in Figure B, were especially hard-hit in the computer and electronic products industries. The shares of jobs lost in this sector ranged from 54.7 percent in Texas to 71.1 percent in Idaho, compared with the national average of 38.8 percent of jobs displaced in this industry (unpublished research results available upon request). Other hard-hit states with a concentration in manufacturing were New Hampshire (86.7 percent of jobs displaced in manufacturing), North Carolina (84.8 percent), and Vermont (86.9 percent), versus the national average of 76.9 percent. New Hampshire and Vermont also saw heavy displacements in computer and electronic products within manufacturing, with shares of 56.6 percent and 60.0 percent, respectively. 15. One frequently repeated criticism of trade and employment studies is that the growth of imports does not displace domestic production. Some assert that if imports from China fell, they would be replaced by imports from some other low-wage country (see, for example, U.S.-China Business Council 2011). However, important new empirical research by Autor, Dorn, and Hanson (2012, 4) has shown that “increased exposure to low-income country imports is associated with rising unemployment, decreased labor-force participation, and increased use of disability and other transfer benefits, as well as with lower wages…” The bottom line is that “trade creates new jobs in exporting industries and destroys jobs when imports replace the output of domestic firms. Because trade deficits have risen over the past decade, more jobs have been displaced by imports than created by exports” (Bivens 2008b, 1). 16. An additional 1.4 million manufacturing jobs were lost or displaced between January and December 2001, prior to China’s entry into the WTO. Thus, a total of 5.3 million manufacturing jobs were lost between 2001 and 2011. From the depths of the downturn in manufacturing employment, in February 2010, through July 2012, 528,000 jobs were recovered (Bureau of Labor Statistics 2012a). Thus, structural factors were likely responsible for the bulk of manufacturing job loss between 2001 and 2011. See Autor, Dorn, and Hanson (2012) for additional research on the impact of China trade on U.S. manufacturing employment and wages. 17. The previous edition of this research used data for 56 industries provided by the ACS (Scott 2011c). The BLS–OEP consolidated several industries, including textiles and apparel, which required us to consolidate data for these sectors in our ACS state and congressional district models. Other “not elsewhere classified” industries were consolidated with other sectors (e.g., “miscellaneous manufacturing”) or deleted (“not specified metal industries”) to update and refine the crosswalk from BLS–OEP to ACS industries. As a result of these consolidations, there are 53 industries in the ACS dataset used for this study. 18. The model includes 195 NAICS industries. The trade data include only goods trade. Goods trade data are available for 85 commodity-based industries, plus software, waste and scrap, used or second-hand merchandise, and goods traded under special classification provisions (e.g., goods imported from and returned to Canada; small, unclassified shipments). Trade in scrap, used, and second-hand goods has no impacts on employment in the BLS model. Some special classification provision goods are assigned to miscellaneous manufacturing. 19. The Census Bureau uses its own table of definitions of industries. These are similar to NAICS-based industry definitions, but at a somewhat higher level of aggregation. For this study, we developed a crosswalk from NAICS to Census industries, and used population estimates from the ACS for each cell in this matrix. AFL-CIO, Benjamin L. Cardin, and Christopher H. Smith. 2006. “Section 301 Petition [on China’s repression of workers’ rights].” June 8. Bivens, L. Josh. 2008a. Everybody Wins, Except for Most of Us: What Economics Teaches About Globalization. Washington, D.C.: EPI. Brock, H. Woody. 2012. American Gridlock: Why the Right and Left Are Both Wrong: Commonsense 101 Solutions to the Economic Crises. Hoboken, N.J.: John Wiley & Sons. Bronfenbrenner, Kate, and Stephanie Luce. 2004. The Changing Nature of Corporate Global Restructuring: The Impact of Production Shifts on Jobs in the U.S., China, and Around the Globe. Commissioned research paper for the U.S. Trade Deficit Review Commission. http://www.uscc.gov/researchpapers/2004/cornell_u_mass_report.pdf. Clinton, Bill. 2000. “Expanding Trade, Protecting Values: Why I’ll Fight to Make China’s Trade Status Permanent.” New Democrat, vol. 12, no. 1, pp. 9–11. FutureofUSChinaTrade.com. 2012. “Labor Productivity Growth: Emerging Economies” (graph). http://www.chinaglobaltrade.com/fact/labor-productivity-growth-emerging-economies-graph. Accessed July 31, 2012.
International Monetary Fund (IMF). 2012a. “International Financial Statistics CD-ROM.” Washington, D.C.: IMF. Scott, Robert E. 2011b. “Hearing on State-Owned Enterprises and U.S.-China Bilateral Investment: U.S. Investments in China.” Testimony before the U.S. China Economic and Security Review Commission, March 30. Stewart, Terence P., and Elizabeth J. Drake. 2010. Written testimony for Committee on Ways and Means hearing on China’s Exchange Rate Policy, U.S. House of Representatives, March 24. Wallach, Lori, and Patrick Woodall. 2011. Whose Trade Organization: A Comprehensive Guide to the WTO. Washington, D.C.: Public Citizen. Xing, Yuqing. 2010. “Facts About and Impacts of FDI on China and the World Economy.” China: An International Journal, vol. 8, no. 2, pp. 309–327. * Total may vary slightly due to rounding.